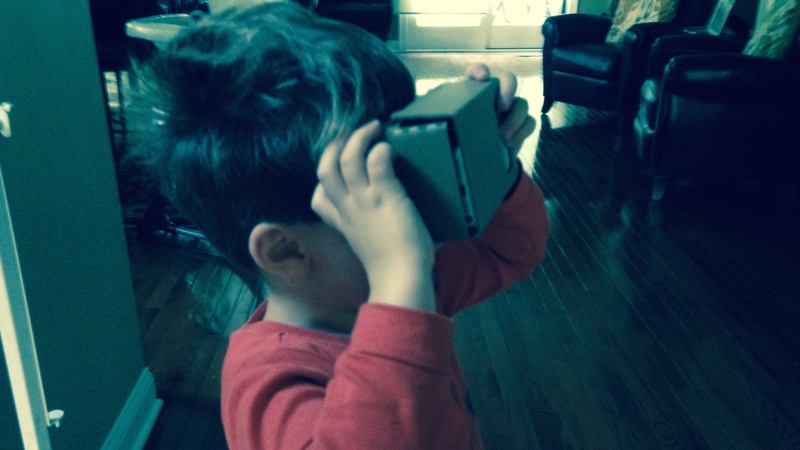 On Saturday my Google Cardboard arrived, and the virtual reality experience got underway… Wait let me correct that, on Saturday the Google Cardboard, which I purchased for my boys arrived, and their virtual reality experience got underway. 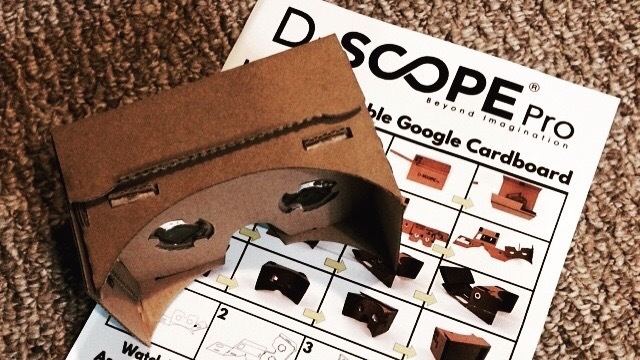 Our Google Cardboard type goggles came from D-Scope Pro. It was quick to assemble and the instructions where easy to follow. 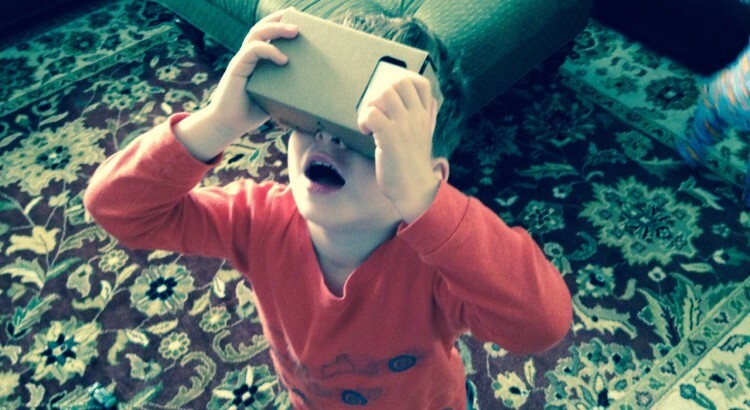 I’m often asked to recommend mobile apps for young children, and Google Cardboard certainly falls into that category even though the technology is still in its infancy. In order to use Google Cardboard and experience it’s virtual reality on your mobile device, you’ll need to purchase* (or make) a set of goggles made out of cardboard (hence the name Google Cardboard). It was certainly fascinating to watch Lucas put them on and look around the inside of a dormant volcano. Like most children his age, he’s so accustomed to his digital world that we skipped the conversation on how it works and was able to immediately immerse himself into his first virtual reality experience. ‘Is this where the lava go?’ he said as he looked down at a hole in the floor. ‘Did it already xclode?’ I encouraged him to look up at a giant hole in the chamber’s ceiling. ‘Oh, I want to see one that hasn’t xcloded? At that point we switched it up and went to Paris to see the Eiffel Tower. Lucas was able to take in the environment and immediately made the connection he was in Paris. At the moment you need to stretch a little to make the connection to creativity, but as the problem-solving games begin to emerge, I expect this device to present new opportunities for the user that will engage creative thinking skills at home and in the classroom. For now parents will need to guide the creative thinking by facilitating detailed observation of the virtual environment on offer, and helping children generate the type of questions that will stimulate curiosity and help make connections to the wider world. There are a lot less internal apps via Google Cardboard for the iPhone, so those with an Android have a lot more on offer, plus there are a few other virtual reality apps available such as Volcano VR, and Moorente (as well as a number of shoot-em up games that I wouldn’t recommend). Overall, I enjoyed my first weekend with Google Cardboard, but avoided the motion apps like the roller-coaster at all cost – yep, I’m one of those guys who get sick ridding the merry-go-round. If you’re intrigued about Google Cardboard check out the video below from TechCrunch, or perhaps you’d like other uses for your mobile phone that engage creative thinking skills.